Our friend Lizz over at More Than Thursdays is a prolific DIYer with an awesome edge. She and her husband, Jamie, not only have built their own teardrop trailer, but they manage to throw the best themed parties for their son, Max (as well as make an impeccable string of Halloween costumes). Perusing her site, we think this craft from Max’s Lego Minifig birthday last year is such a cool idea from start to finish. Using a minifig mold she found on Amazon and plaster of Paris, Lizz made 15 large and 45 odd medium paintable minifigs as the party craft and take-home favor. After some experimenting, she found priming the figures helped to create the best colorable surface, both with acrylic craft paint and plain old regular Crayola markers. While obviously a brilliant party activity, we think this craft could be an awesome summer project from start to finish, albeit on a slightly smaller scale. Lizz used 1/4 cup of plaster to fill the mold, which took about an hour to dry. Adding priming (we’d suggest a good spray paint primer) application and dry time, you could definitely build a whole day around making the molded characters and decorating them (and sealing them, if you’d like to ensure your child’s artistic vision is preserved for years to come). We say throw on The Lego Movie for some inspiration (and sweet tunes) and just go all-out on a rainy or blistering day. We think these minifigs would make great kid’s room decor or perfect for gift giving — possibly for (dare we say it) back-to-school or even the holidays. 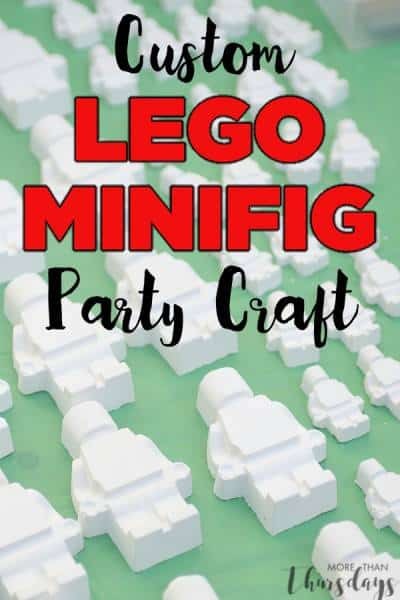 With such a blank canvas, seeing your kids’ imaginations go wild while making their own Minifig sculptures from start to finish is surely worth every moment of this adorable all-ages craft.